This is the third book in the Graceling Series. I talkedabout the first two books, Graceling and Fire here. Obviously, as this is the third book, anything from here on in is going to be really spoilery for the first two books. Consider yourself warned! Bitterblue focuses on Bitterblue (obviously), who is saved from Leck, the King of Monsea and Bitterblue’s father, by Katsa (I initially wrote Katniss, hehe) and Po in Graceling. She is now the queen of Monsea, and is working to help the country to recover from the effects of Leck’s reign, while also trying to figure out what kind of queen and person she is going to be. 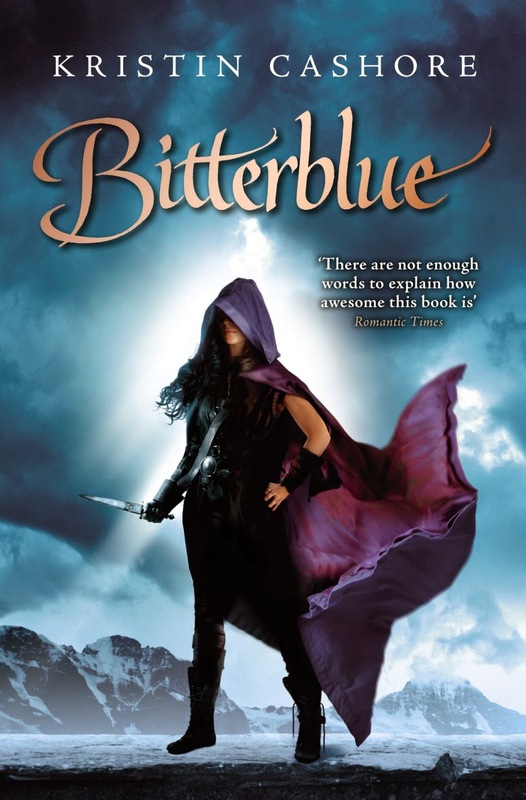 I found Bitterblue immensely likeable in Graceling, and I still felt the same about her in this book. She feels like a real person, she makes realistic mistakes, and it was interesting to see her grown up (this book is set 8 years after Graceling) and trying to handle the responsibility of helping her country get back on its feet. I liked the fact that there was an 8 year gap, as I feel that a book set immediately after Leck’s reign would have got a bit tedious quite fast. As I said in my review (if you can call it that!) of Fire and Graceling, I didn’t enjoy Fire as much and felt that the romantic elements dragged it down somewhat. I didn’t feel this with Bitterblue, and definitely enjoyed it more than Fire. It definitely covers some of the same ground as Fire, namely how to deal with the legacy of an evil parent, but I think it did it better, and really enjoyed reading it. I would be very happy if there is another book in this series, as I have enjoyed reading all of the books so far! I think that this way of doing a series, where they are all set in the same world but not necessarily about the same people works really well here. It also means that it avoids some of the problems a lot of YA trilogies have, where each book needs to ramp up to some kind of epic conclusion at the end which almost inevitably falls a bit short. I would much prefer to read this kind of thing, where each book has connected threads with the others, but is also a self-contained story. Having said that, I did like that some of the characters from previous books make appearances too, and I remembered who they all were! (Unless I read books several times I tend to forget everyone apart from the main characters, and I forget them sometimes as well) Yayyyy! The stupid names must have helped. I don’t know what more to say apart from if you enjoyed Graceling and/or Fire, you will probably like this one too. Oh and I haven't mentioned this anywhere, but I HATE the covers of these books. I realise I am probably not the target audience, and I read them all on a kindle anyway so the cover isn't really a factor, but still... This is probably (definitely) me being a big snob, but I would NEVER have tried these books if I hadn't heard good things about them. Yeah yeah, don't judge a book by its cover and all that, but when there are so many good books out there to choose from, the cover design does end up coming into it!